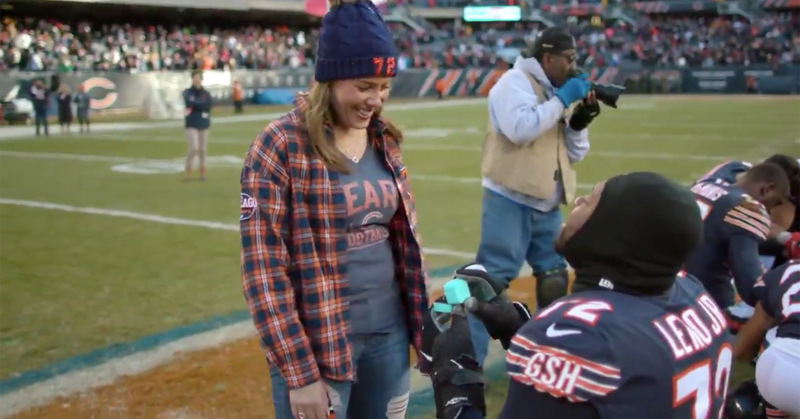 On Sunday, NFL fans got to enjoy some football with a side of proposal season after a Chicago Bears player decided to propose on live television. Bears left tackle Charles Leno came prepared following his team’s victory over the Green Bay Packers at Soldier Field. While the moment was significant for the team (the Bears finally clinched the division title), the attention turned to Leno who was awaiting his girlfriend Jennifer Roth’s arrival to midfield. Once she got to the “C” emblazoned upon the middle of the field, Leno then dropped to one knee and he pulled out a turquoise ring box to propose to his girlfriend of six years. “Jennifer Marie Roth, would you love to be Jennifer Marie Leno?” he asked on national broadcast. She said yes just as the stadium played “Marry You” by Bruno Mars. On the field, Leno’s teammates happily celebrated around while both sides of the couple’s family cheered on the newly-engaged pair from the stands. Be the first to comment on "Chicago Bears Player Charles Leno Proposes on Field After Team Clinches Division Title"